The next Harry Potter words to join the dictionary? Quidditch - the game played by Harry Potter - is now magically appearing in the Oxford Dictionaries, joining that other Potter term "muggle". But what other words dreamed up by author JK Rowling are on the cusp of gaining official recognition? Potterhead... Wrock... Bellatrix... three terms that muggles may not understand. And if you need to be told what a muggle is in the first place, then you can at least consult a dictionary on that one. The BBC has learned that another small list of words associated with the Harry Potter book series is on the Oxford University Press watchlist, which decides on the words likely to gain inclusion in its dictionaries. Potterhead refers to a fan of Harry Potter, while Wrock [short for Wizard Rock] is a genre of Harry Potter-related music. Bellatrix is the name of a character in the series, which Rowling named after a star in the Orion constellation. The Oxford University Press has a vast database of some three billion words ready for editors to consider for publication in the Oxford English Dictionary (OED) and the website Oxford Dictionaries. The OED is a historical dictionary which records all the core words and meanings in English over more than 1,000 years, while the latter tracks "current" English and includes modern meanings of words. Most words have to be in circulation for 10 years before they will be considered for the OED, but in the meantime many enter the Oxford Dictionaries website after careful consideration. Rowling's word "muggle" - which made its debut in 1997's Harry Potter and the Philosopher's Stone - was an exception to the rule. Muggle leapt into the Oxford English Dictionary in less than half the usual time, appearing in 2002 as "a person who lacks a particular skill or skills, or who is regarded as inferior in some way". Charlotte Buxton, an associate editor at Oxford Dictionaries, explained that some words are fast-tracked if they "cross into our world" quickly and are widely used. She said: "It's fairly unusual for a made-up word to get in. 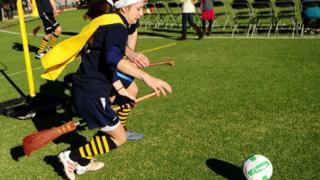 They have to move beyond the book - quidditch is now a real sport, not just a made-up game. "It is really significant as it shows that Harry Potter has had such a huge impact." Ms Buxton said she thought "Horcrux" - an object which contains a wizard's evil - might be next on Oxford Dictionaries' radar. She added: "Harry Potter could be ripe for a project." Previous Oxford University Press projects include last year's focus on Roald Dahl as a celebration of the centenary of his birth. Almost 8,000 real words - and invented ones - were included in a special Roald Dahl dictionary, which took five years to compile. Of these words, several do have a place in the OED, including golden ticket, oompa loompa and human bean. Ms Buxton said it has been children's authors, such as Dahl, who have tended to coin the most new words over the last century because they are the most playful and creative. "In particular, authors who create their own language - such as [Lord of the Rings author] JRR Tolkien. He created a complete world with its own language. "Writers who do that - like JK Rowling - really make their mark." she said. Other realms which have crossed into ours are the fantasy fiction of Twilight, and the animated comedy show The Simpsons. The Simpsons lays claim to three words in Oxford Dictionaries: Jeebus, cromulent and embiggen. It is also credited for popularising the word "meh" - which has been added to the OED. "Children's books are read by children and by adults to their children, which leads to words being used within the family and beyond," Ms Buxton said. This gives the words better staying power. Meanwhile, realist authors, such as the Victorian author Charles Dickens, tend not to create as many new words as they are concerned with reflecting the real world, she said. It is William Shakespeare who is famously credited for having the biggest influence on the English language - providing the first evidence of more than 1,600 words, from "admired" to "watch-dog" and "night owl". But Ms Buxton says it is hard to know how many words Shakespeare invented and how many he simply recorded. What we do know is that not all of them stood the test of time: has anyone met a "flirt-gill" recently? Superman: A translation of the German Übermensch used by philosopher Friedrich Nietzsche to denote the concept of an "ideal superior man of the future". Blatant: Invented by Edmund Spenser in his epic poem The Faerie Queene (1596), where he wrote of a "blatant beast". Robot: Coined by the Czech author Karel Capek, robot made its first appearance in a 1920 sci-fi play called R.U.R, short for Rossum's Universal Robots. Cyberspace: Invented by William Gibson for a 1981 science fiction short story called Burning Chrome, which was published in Omni magazine in 1982. Serendipity: Coined by Horace Walpole in a letter he wrote to Horace Mann in 1754, after the title of the fairy tale The Three Princes of Serendip, the heroes of which 'were always making discoveries, by accidents and sagacity, of things they were not in quest of'. Eucatastrophe: Coined by JRR Tolkien in a 1944 letter to describe "a sudden and favourable resolution of events in a story; a happy ending". Doublethink: In George Orwell's novel Nineteen Eighty-Four he created a language called Newspeak which included the word doublethink - which refers to the acceptance of contrary opinions or beliefs at the same time. Blurb: Coined in 1907 by the American humourist Gelett Burgess, "blurb" was first found on a comic book jacket embellished with a drawing of a young lady whom Burgess dubbed "Miss Belinda Blurb". Chortle: Introduced by Lewis Carroll in Through the Looking Glass, published in 1871, the word is probably a blend of chuckle and snort. Cloud cuckoo land: In his comedy Birds, the ancient Greek playwright Aristophanes named the city built by the birds to separate the gods from mankind - it was translated into English in 1824 as "cloud cuckoo land".